Fancy changing your eye colour for a day? Natural-look contact lenses are a great way to change your eye colour and completely transform your look – but just for a day! There are many different types of contact lenses available, including lenses that are specially designed to look natural and convincing. Natural blue contact lenses are one of the best ways to transform your eyes. The blue is a universally flattering eye colour that will light up your complexion and give you a beautiful new look. There are so many different colours to choose from, I have picked out a few natural blue contact lenses that will work for anyone. Personally, I find that it is important to consider how dark or light the coloured contact lenses are in comparison to your own eyes. For example, deep blue contact lenses with a black outline look more natural if you have dark brown eyes; while pale blue contacts look best on people with light hazel or green eyes. 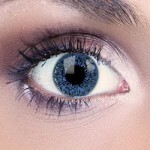 Here you can see three of my favourite natural look blue contact lenses. These lenses are specially designed to blend in with your natural eye colour for a soft, convincing effect. The two lenses on the left are especially good at this. They feature a dappled pattern on a clear background. The background lets your natural eye colour show through, giving a natural blended effect. The lens on the right does not have a clear background. It has a lovely deep colour and dramatic outline, perfect for people with dark-coloured eyes. You can also buy your natural blue contact lenses in a kit. 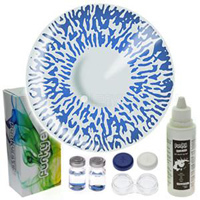 These kits have everything you will need to wear and clean your contact lenses. This includes contact lens solution and a contact lens storage case. It is very important to keep your contact lenses clean and store them correctly in between uses. This will keep your eyes safe and reduce the risk of eye irritation. How Long Can I Wear Coloured Contacts For?